Special occasion? Someone need cheering up? Or just any reason to celebrate? Oh what the hell, when you need a cupcake you need a cupcake!! For some time we have undergone a voyage to discover the very best cupcakes around, and by this we mean ones that taste as good as they look rather then simply just a visual treat. On this voyage we discovered Lola's Cupcakes. Lola's cupcake's are freshly baked and iced to perfection, and are unmissable! The cupcakes come in an array of intense flavours including peanut butter, rocky road and banana to name just a few! Trust me, with each cupcake looking so gorgeous, indulgently covered in sprinkles, glitter and delicious buttercream (depended on the cupcake flavour) and each so flavoursome its near on impossible to name a favourite. Sometimes people can find the sweetness a little too overwhelming with Lola's standard cupcakes, but fear not Lola's have the remedy with there compact mini cupcakes that still lock in the intense taste but are bite sized! 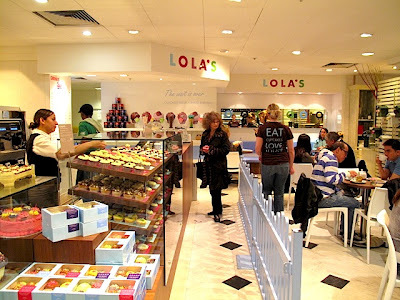 Lola's flagship store can be found in Mayfair, London on Berkeley Square but there are also concessions in Harrods (London, Knightsbridge) , Selfridges (London, Oxford Street) and Topshop (London, Oxford Circus). 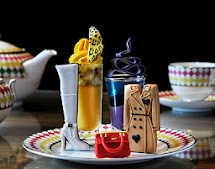 We regularly stop for a cupcake when we are shopping in either Harrods or Selfridges which can be a delicious tactical break when indulging in retail therapy. Lola's Cupcakes tick every box, and I would say are amongst the best cupcakes to be found in England.